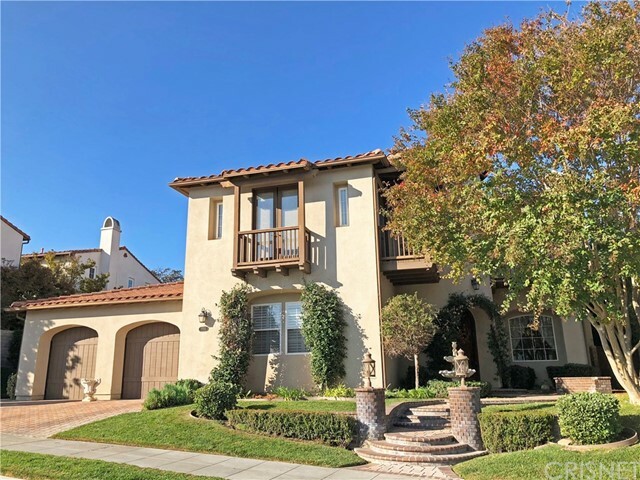 All Valencia homes currently listed for sale in Valencia as of 04/25/2019 are shown below. You can change the search criteria at any time by pressing the 'Change Search' button below. If you have any questions or you would like more information about any Valencia homes for sale or other Valencia real estate, please contact us and one of our knowledgeable Valencia REALTORS® would be pleased to assist you. 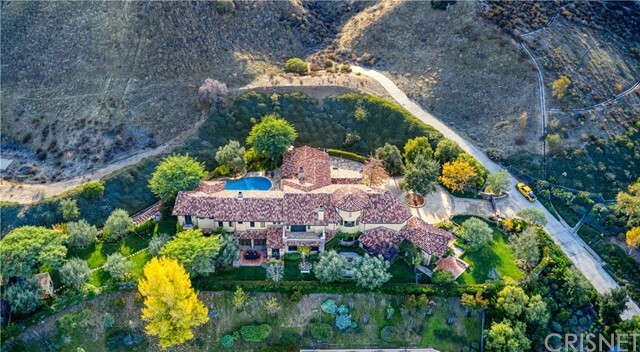 "Redefining world-class style and elegance, this private and custom-built estate of incomparable quality is located in the exceptional gated community of Westridge Estates, in the prestigious Stevenson's Ranch area. This residence of 10,500+ SF features 5 bdrms/7 baths, including a maid's room, with five fireplaces and is on just under 1 acre of land. This light-filled property welcomes you with stunning city and Oak Reserve views seen throughout the home, an expansive two story library/office, a large, beautifully appointed kitchen with top of the line appliances, an inviting family room with detailed, rustic elements, an authentic bar w billiards table and juke box and a grand entry hall. Further amenities include a gym, swimming pool, a fountain and water fall as well as an outdoor grill and dining area. All is highlighted with only the finest materials and blended with rich woods, hand-cut stone, soaring ceilings and warmth." 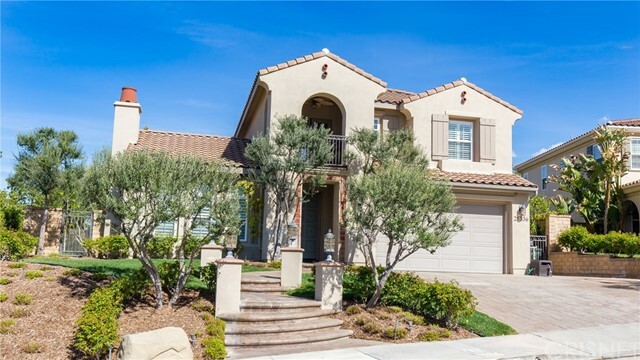 "The guard-gated estate homes in Westridge Valencia represent the VERY best that Santa Clarita offers. This masterpiece features the rare combination of perfect location, large private lot w/ multiple entertaining areas & pool, panoramic views of the valley, the highest level of craftsmanship, and a comfortable & well-designed floor plan. If it were even possible to replicate, it would cost far more than the asking price. So for those that truly want it all... here it is. Tucked at the end of your own private drive, the iron gates open to a circular driveway built entirely in stone. The expansive grounds feature multiple entertaining areas, none of which can be viewed by any neighbor. You really are above it all. Custom doors & windows, including popular accordion doors open to patios, fountains, covered eating areas and outdoor game areas w/ fireplace. The over-sized pool continues the extensive use of stone hardscape & the sunken BBQ cook station w/ swim up bar is both fun & functional. With an acre of beautifully manicured grounds & views of the valley, unbelievable is the only word to describe the setting of this home. With 6 bedrooms, 6 full private baths, 2 half baths for guests, a media room & 2 family rooms, the floor plan offers what people want in a home for comfort while still maintaining the grandeur of the finest custom home available. For complete details on how no expense was spared to create this home, request a detailed description (available in supplements)." 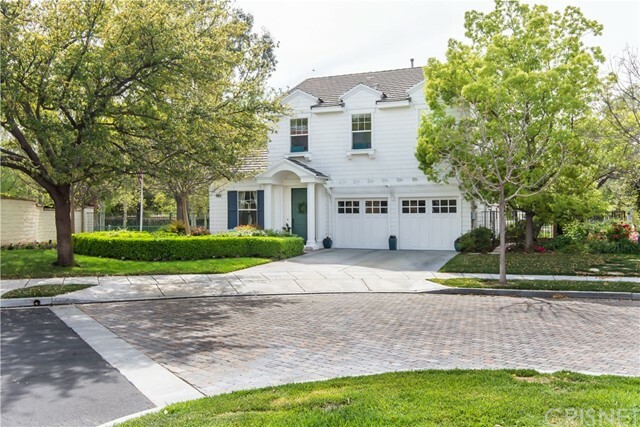 "25711 Shady Oak Ln is a true masterpiece in the most prestigious guarded & gated community of Westridge Estates in Valencia. This custom built home was meticulously designed with comfort and luxury in mind. Enter. The massive almost 3,000 sf, 12-car underground garage and entertainment space is also equipped with 3, electric car chargers powered by a MASSIVE 600 amp electrical panel. Dance floor, Pool Table Room, Bar, Tatami Tea Room, Outdoor Patio, and a large Movie Theatre with a stage & sound system, are all part of the luxuries of this basement entertainment area. Access the main floor or 2nd floor through the built-in elevator. From the main entrance, you ll be greeted by a massive 25+ foot foyer with the walls elegantly finished with smooth Venetian plaster and custom art decor. The gourmet kitchen are equip with top grade appliances, including a Wolf Range, 2 sets of refrigerators, bar service area that leads right into a comfortable and open breakfast and living room area. Entertain guest in the large patio with outdoor kitchen and amazing views of the private pool and city lights. 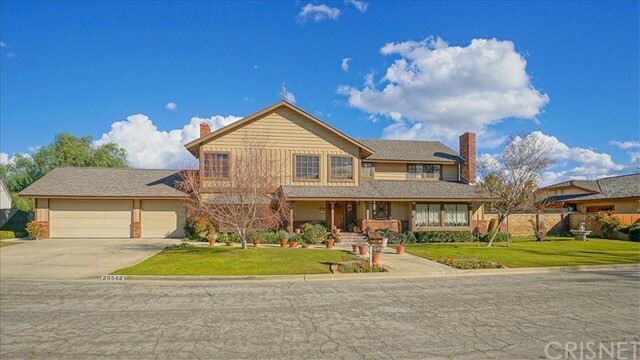 This is truly a one-of-a-kind home with the Westridge Amenities that include: Tennis Courts, Community Pool, Clubhouse w/BBQs, Tot lot, and 24 hours Guard Gated." "Dream home on the 18th hole of the Oaks Club in Valencia. Built in 2011, this 5 Bedroom, 7 bath home features an en-suite bath in every bedroom. Enter the grand turret entryway with a waterfall fountain leading into the majestic front hall and staircase. The massive great room has a full bar with ice maker and fridge. An open concept family living area overlooks the golf course with impeccable views of the California skyline. The chef s kitchen features granite counter tops and 4 walk-in pantries including a wine cellar. Dine by the sunset views or in the separate formal dining area. Outside, the patio features a pebble sheen swimming pool, spa, waterfalls, and full outdoor bathroom with rock shower. Beside the pool is an outdoor kitchen with BBQ, pizza oven, fridge, and sink with multiple covered seating areas, gazebo, garden, and fruit trees. 3 fireplaces, 2 indoor and 1 outdoor. Throughout the home, you will find travertine and wood floors, barrel and beamed ceiling, iron railings and doors. There are 2 master bedrooms (upstairs and downstairs) with giant walk-in closets and custom cabinetry. 4-car garage with plenty of built in storage. Massive laundry room. With so many amenities to list, it would be best to come see all this home has to offer in person." "A True Westridge Craftsmen Custom Spanish Colonial home on a large private acre lot! Located behind the gates, this 6 bedrooms, 7 bath home includes a gorgeous kitchen with 2 sweeping islands, a large private suite with 2 staircases, exquisite master with a gym room, 2 walk-in closets, lavish master bath, a formal living room, a formal dining room, an office, oversized theater room, all bedrooms suites have private baths, dramatic foyer with spiral staircase. Entertainers yard with custom pool/spa, large covered patio, built-in Viking BBQ and fire pit. 3 separate garages for up to 7 cars with AC plus workshop area. This home features 13-foot ceiling, custom Brazilian Teak wood, travertine, marble flooring, vibrant wood beams ceiling, top of the line stainless still appliance and spectacular chandeliers throughout. Don't miss this one of a kind Estate." "One of the best views at Westridge with an equally spectacular interior that was completely redone in 2018. In addition to lavish sized living spaces beds and baths, this home has a Swimming Pool, Spa, a Game room, an Office, upgraded appliances, natural stone and wood finishes throughout, and the many luxuries that make suburban living so desirable. Exterior Security Cameras. Surround sound in living spaces. Electric Car Charging capability. Closets in Garage. Outdoor living with Viking range. 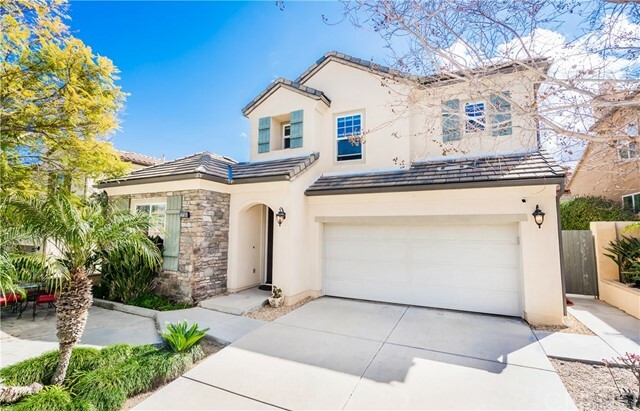 Walking distance to SCV s best schools and outstanding neighborhood amenities that include pool, spa, picnic areas, play grounds etc. Over $150,000 spent in the 2018 remodel." "Absolutely Stunning! 4484+ square foot home comes packed with amenities suitable for the most extravagant buyer. The design, character and attention to detail begins at the curb and continues throughout this beautifully manicured family home. Custom stamped concrete, solid-insulated wood garage doors, custom rod iron fencing and custom front door with glass panels. Tall ceilings and travertine flooring, recessed lighting and custom wood details, a formal living & dinning room with connecting butlers pantry and 1 of 2 master bedrooms, all been meticulously upgraded. The open kitchen with an extra large granite center island & ample bar seating adjacent to the family room and overlooking the beautiful back yard are the perfect gathering areas. Extra Large salt water fish tank is built in to an entire wall of the family room, providing a relaxing showpiece of museum quality. Backyard has everything you could dream of, and more. Sunken bar with top of the line stainless steel ice maker, keg, granite countertops, ceiling fans, televisions and tiled floors. Covered cabana with BBQ, sink and bar height seating. Showpiece Pool complete with several water features, sheers and an adjacent jacuzzi. Outdoor seating and a fireplace, along with a fountain, fire pit and two levels of seating and pergolas add to this spectacular outside area. All this, and it's just the first floor! A MUST SEE!" "Stunning Entertainer's Pool Home with detached Casita in the Prestigious Woodlands Guard Gated Community. As you enter this Presidio you will notice the fine details and Architectural Design of this Magnificent home. This highly upgraded home w/Peek-A-Boo views is located on a cul-de-sac that features: 5 Bedrooms, Large Master Suite w/Turret overlooking the Beautiful Peek-A-Boo City & Mountain views, Luxurious Master Bathroom w/Plantation Shutters, Upstairs Bedrooms w/ensuites, Downstairs Bedroom & Bathroom, Central Vac & enormous Game/Bonus Room with custom Built-Ins and a Balcony with Mountain Views plus a large Tech Center. Large Family Room w/fireplace, Crown Moulding & Custom Entertainment Center overlooking the Sparkling Pool & Spa, Gourmet Kitchen w/Viking Stove Top, Stainless Steel appliances, Large Granite Island, Nook Area and Formal Dining Room was recently Professionally Painted. Dramatic Living Room with Cathedral Ceilings, Stunning Fireplace and Plantation Shutters. 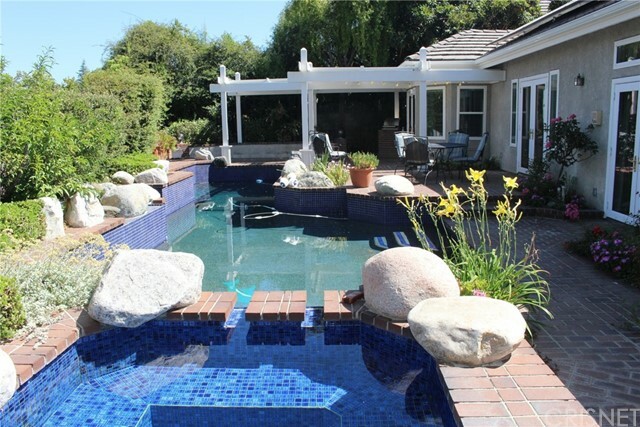 Fabulous Entertainer's Backyard w/Cascading Waterfall into Pool & Spa. 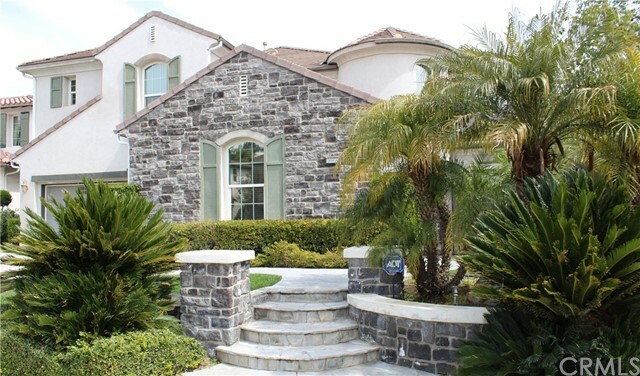 Professionally Hardscaped & Landscaped. Woodlands amenities include a Jr. Olympic Pool, Spa, Tennis Courts, Tot Lot, Sport Court. Close to Award Winning Schools, Shopping, Restaurants & Easy Freeway Access. No Mello Roos." "Elegant Presidio home in the prestigious gated Woodlands community with 5 bedrooms 6 Baths! Gorgeous curb appeal featuring the popular Spanish exterior. This lovely home features 5 spacious bedrooms all with private en-suite baths plus huge upstairs bonus/entertainment game room. One full guest bed and bath downstairs. This beautiful home boasts to many upgrades to list! Downstairs feature dark hardwood floors, crown molding, plantation shutters, custom window treatments, formal living room with fireplace, formal living, family room with fireplace. Gourmet kitchen with Viking cook top, white cabinets, granite counter tops, huge granite island with seating, built-in refrigerator, double ovens, plenty of storage and eat-in nook. French doors invite you to the inner courtyard with impressive outdoor fireplace and private patio area to entertain and relax. Very private backyard setting overlooks lush greenbelt and paseo, built-in BBQ. 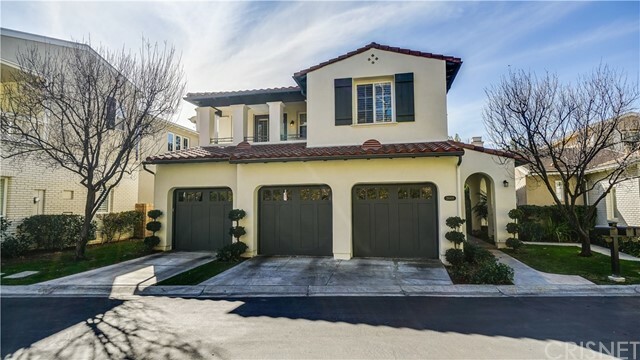 The only Presidio model with sought after 4 car garage. 24 hour guard gated Valencia Woodlands community with Jr Olympic size pool, spa , tennis courts, sport court, Tot Lot and more! Excellent location, Close to shopping, restaurants & excellent schools!! Easy freeway access. NO MELLO ROOS!!" 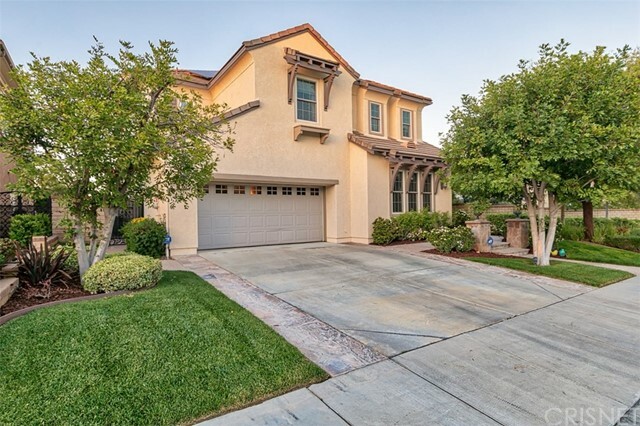 "Located in the prestigious Masters Community in Westridge Valencia! This pristine, highly upgraded home features a rare spacious, ground level master suite with direct access to the sparkling pool & spa. The lower level features a formal living & dining room with Minka chandelier, and custom, climate controlled, 450 bottle wine closet. The large gourmet kitchen features a center island, granite counters & backsplashes, underlighting, and stainless steel appliances, including sub-zero refrigerator, and Wolf Cook-Top. Off of the kitchen, you will find a breakfast room with french doors to the private courtyard and a large family room leading to the backyard. Gorgeous Travertine flooring throughout the first level. The upper level offers 3 bedrooms, one with private en-suite bathroom, a jack-n-jill bathroom and a large bonus room/gym that could easily be a 5th bedroom. Upgrades throughout the home include crown molding, custom baseboards, upgraded beveled mirrors, fans/light fixtures, plantation shutters, retractable screens, video surveillance, intercom, surround sound and leased solar. The private entertainers backyard offers a sparkling pool, spa, built in BBQ, 12'x14' Covered Pergola and a fireplace. This home is situated on a private, large corner lot with landscape lighting surrounding the property, upgraded hardscaping, landscaping and a huge side yard off the 3 car tandem garage. This smart home is CAT5 wi-fi ready! No expense has been spared in this turn-key home!" "Amazing Pool Home in the Prestigious Westridge Valencia Community. Presenting a gorgeous 5 bedroom, 5 bath home with a true designer's touch. Opening the custom wood entry door reveals a foyer with inlaid mosaic flooring, which then leads to the formal living and dining rooms, both with wide-plank hardwood floors. The gourmet kitchen has a Sub-Zero refrigerator, Wolf oven and cook top, large island, private eating area, and walk-in pantry. The front stairway has an office/library on the landing, with a huge storage/play area underneath. Upstairs you'll find a bonus room and three guest bedrooms, one with an outdoor terrace. The master suite has hardwood and travertine flooring, walk-in closet, large soaking tub, frameless spa shower, and a peek-a-boo view of the surrounding mountains. Throughout the house you'll find plantation shutters, 5 crown molding, 6 floor molding, wainscoting, and new Berber carpet. In the meticulously landscaped backyard you'll find a completely restored Roman pool and spa with PebbleTec, built-in Lynx BBQ and fridge, and sitting area with custom fireplace. TPC Valencia and Valencia Country Club are nearby, as is access to schools and I-5. Featured cover story in four issues of Inside SCV magazine. Welcome to your new home!" 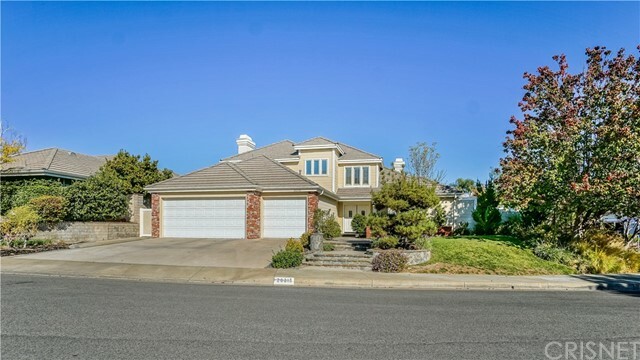 "A Prestigious and highly desired Bridgeport Island home in Valencia. This former model is 3,816 sq ft with one of the largest lots on the waterfront. The large floor plan offers 4 bedrooms and 5 baths. Upon entering the home there is a formal living room with wainscot walls. The formal dining room opens with double doors to an outdoor sitting area and side yard. The downstairs also features a large open kitchen with breakfast nook, a family room that is open to the kitchen with views to the water and a bonus den with a full bathroom. Once you go upstairs there is an open loft with a window seat. The large master features a sitting room, large master bath and a balcony to enjoy your views. There are 3 additional bedrooms upstairs with 2 bathrooms. Bridgeport offers lots of amenities including a walking track around the lake, paddle boats in the lake, pool, spa and a large clubhouse for hosting large events. This is a great overall location in a gated community that is walking distance from schools, restaurants and has close freeway access. Make an appointment today for a private showing." "A True Gem of prestigious Terraza Community in Tesoro Del Valle. Great City View with private Pool & BBQl! The Home welcomes you through the front porch. Open space with a den, living room and formal dining room in downs stairs. Upscale Kitchen with granite counter tops and SS Appliances. One bedroom with full bath downstairs and powder room. 2 cozy fireplaces in living room and family room. Huge Bonus Room and another family room area upstairs. Master Suite with entertaining area and balcony. 3 more rooms upstairs. 4 car garage. Laundry room in downstairs. 2 separate AC units. Lots of Community facilities. A Must See Home!" "PRICED TO SELL! This is a large, beautiful house that you will be proud of. 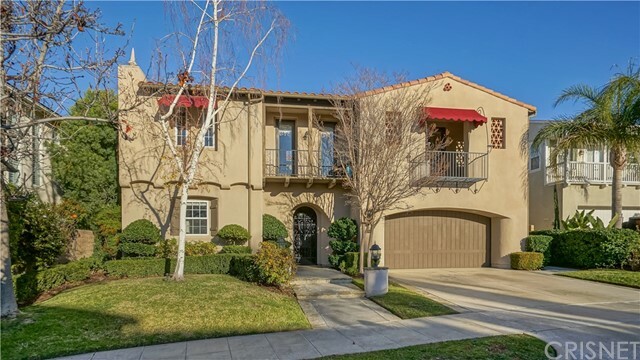 Located in one of the BEST neighborhoods in LA County with some of the BEST PUBLIC SCHOOLS in California. #BlueRibbonSchools . How much can you save by not paying private school tuition? $20,000? $30,000 per year per student? *** While you're thinking, consider what this home has to offer. Exquisite Travetine tile flooring... Designer Paint Finish in today's most desired colors and Crown Moulding throughout. * Beautiful, leaded Glass Doors, Granite Kitchen & baths, a cook's island in the expansive kitchen. The family room with it's inviting fireplace, recessed lights, and Surround Sound is perfect for holiday entertaining. Bedrooms and baths are impressive in size and attractiveness. The Master Suite (with ensuite bath, of course) is grand in nature, allowing one to sleep in one part of the room, while tv watching can be done in another area. One large bedroom downstairs (perfect for grandparents), the rest of the large rooms are upstairs. *** Backyard entertainer? Oh, your friends will love coming over to enjoy your large, sparkling pool w/ hot tub, Built-in BBQ, and lush landscaped back area. You made it. Home. And...No Mello Roos!" 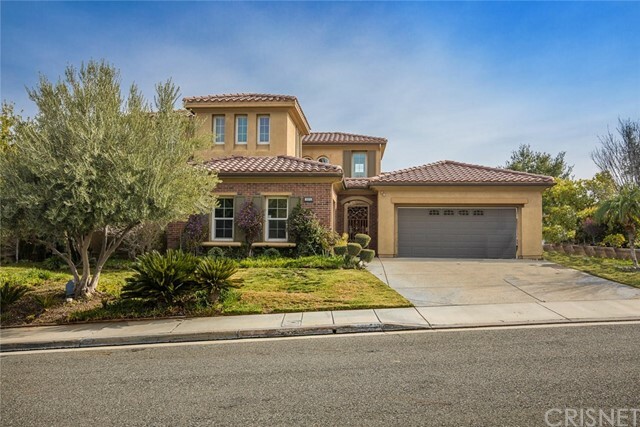 "Stunning Executive home in the Prestigious gated Westridge Valencia Community with PAID SOLAR. This magnificent home features 5B/4.5B(1st flr bdrm w/full bath). Distressed wood floors, Exceptional crown & base molding, Formal family room w/lots of windows for natural light, Formal dining room, butlers pantry, kitchen w/granite counters & back splash, ctr island, gorgeous maple cabinetry, Stainless Steel appliances, dble ovens, built-in fridge. Large brkfst nook leading to the spacious family room w/wood paneled walls, custom built Entertainment ctr. recessed lights, Surround Sound & a gorgeous Frplc. Up the elegant wrought iron staircase, you'll step into the cozy loft, an Ofc. The spacious master bedroom runs along the entire back of the house w/a oversize deck w/magnificent views of the valley, mountains & city lights. 2 walk in closets lead you to the large Master bath w/a soaking tub, stall shower & dbl sinks. There are 3 additional bdrms+bath(1 w/en-suite bath). Closet organizers & fans in every room. Lndry rm w/cabinets. The backyard is an entertainers dream come true w/a large covered patio, upgraded landscaping, a custom built fireplace, built in barbeque w/a bar seating to enjoy the tranquility & countless sunsets. Other upgrades include Anderson windows & doors, Nest thermostats, freshly painted exterior & interior. 3 car tandem Grg. HOA includes 2 pools, clubhouse, park and security patrol. Award winning schools, easy FWY access & TPC golf course. NO Mello Roos." "Wonderful Pool and View Home in Tesoro Del Valle. Presenting a 5 bedroom, 5 bathroom, 3-story home on a 15,000+ sq ft corner lot...one of the largest in the area! Entering the house you'll see a large courtyard with fountain. Inside you'll find a huge kitchen with creme cabinets, granite counters, stainless steel GE Monogram appliances, double ovens, 6-burner gas range with hood, and a breakfast bar. The family room off the kitchen has a built-in entertainment center and a brick fireplace. Also on the main floor is a formal dining room, living room, 3/4 bath, and an office with hand-carved built-in cabinetry and desk. Much of the main floor has beautiful cherry wood flooring. On the second floor you'll find four bedrooms, including the master suite, and the laundry room with cabinets and sink. The master suite has double sinks, vanity, separate tub, shower, and water closet, travertine flooring and counters, and a large covered balcony with pool and mountain views. The third floor has another bedroom, with bonus room and 3/4 bath. The over-sized backyard has a saltwater pool and spa with waterfall, grassy play area, covered patio with fireplace, stamped concrete decking, and separate built-in BBQ and bar. The garage holds 4 cars. Welcome to your new home!" "PRICE SLASHED AGAIN! NOW UNDER 1 MILLION DOLLARS! Awesome floor plan on this Emerald home located in beautiful Westridge! Over 3,500 square feet of living space featuring 5 bedrooms, and 3.5 baths. There is a downstairs master bedroom, and two additional bedrooms, upstairs has a loft and two other bedrooms. This home has extra privacy compared to others, it sits next to an open garden area on Pebble Ridge Drive and a great view of the golf course. There is a 3 car split garage and upgraded hardscape in rear yard. Walk to Oak Hills Elementary School! Cul de sac street with no homes directly across the street! Resort style amenities include community pool, spa, tennis, clubhouse and more! No Mello Roos. Low HOA dues. Property SOLD Strictly AS-IS." "Ironwood home located in the guard gated community of the Woodlands in Valencia with great golf course views of the 5th fairway of Valencia CC.Custom upgrades throughout this beautiful home.Large family room with fireplace and opens to outdoor patio backyard.Master bedroom is downstairs and extremely large with incredible bathroom and dual closets.New upgrades include updated custom fireplaces,entire home with custom wood flooring.Upstairs is a large open area for library or study.There are 3 bedrooms with 1 more optional room for an office or 5th bedroom.Kitchen has newer appliances,granite counters,pantry,large center island and barstool seating.This home is situated in a cul de sac and very quiet location.The community hoa center has pool and spa,parks,basketball courts,lots of trails within this gated community.The Woodlands amenities include,Pool,spa,tennis courts,sport court,tot lot.No mello roos." "Single Story, with private gated entry within the highly esteemed Windemere at the Valencia Summit. Brick walkways with an impressive court-yard entry. Entry/foyer has high ceilings that extend into the formal living roomm with french doors that lead to & provide views to the rear yard and the tranquil swimming pool and spa. The formal dining room/family room shares a dual-sided fireplace and has french door views to the rear yard. The updated kitchen has stainless appliances, tile backsplash, solid surface counter tops and dine-in space, that also has french door entry to the rear yard swimming pool and adjacent built-in BBQ/cooking area. The kitchen has a pass-through opening and view to the family room/dining room, appointed with a fireplace and wet bar amenity. The 4 bedrooms and 4 bathrooms are all generously proportioned The spacious den boasts high ceilings & french doors that provide lots of natural light. The largest en-suite bedroom has a separate retreat w/fireplace, built-in book case, walk in closet and access to the spa/pool and gardens. The lush green rear yard has fruit trees and a foliage lined fence for added privacy. Newer dual pane windows have energy conserving glass, single pane French doors & led recessed lighting also add to this homes energy efficiency. Attic fan system helps keep this home cool, along with the newer dual zone A/C units. The swimming pool has newer pebble tech surfacing. 3 car parking garage with newer roll-updoors. A must see home!" "The yard's the thing! Owner redid the original to expand the usability and make a wonderful entertainers private oasis with pool/spa, awesome travertine stone hardscape, water features, full sized patio cover - thoughtfully designed and exceptional quality used throughout. Low maintenance too. Popular floor plan with 3 large bedrooms up plus a spacious loft. All with their own full bath. Half bath down for guests. Granite kitchen, tile floors, upgraded appliances & more to make this one of the best pool homes in Valencia. Located at the end of the quiet cul-de-sac in this terrific gated community with the highest rated schools & amenities - pool, tennis, clubhouse & more. Low HOA & no Mello Roos! Come home to Westridge!" "Stunning Upgraded Windemere located in the prestigious Valencia Summit! True Pride in Homeownership! As you enter this Magnificent home you are drawn to Architectural Style w/Cathedral Ceilings, Newer Walnut Wood Flooring, Plantation Shutters, Beautiful Banister with a Decorator's Design. This Extraordinarily Upgraded Entertainer's home is professionally painted. An elegant entry leads you to the large living room with fireplace, Wet Bar w/Granite Counter tops. Gorgeous Gourmet Kitchen w/large newer Granite Island w/Pendant Light Fixtures, Granite Counter Tops w/Subway Tile Backsplash, Stainless Steel Cook Top, Hood & Dishwasher, Double Oven, Nook area. Family Room w/Fireplace that has French Doors. Large Formal Dining Room with French Doors. Home features 4 Large Bedrooms w/ceiling fans,(large upstairs bedroom w/en suite), Gorgeous Downstairs Master Suite w/separate seating area w/a cozy fireplace. Updated Master Bathroom w/travertine countertops and porcelain backsplash, upgraded flooring, porcelain tile around tub/spa shower.Two walk-in closets. Updated Secondary Bathrooms. Fabulous Entertainer's Backyard with covered patios. Professionally Hardscaped and Landscaped. Milgard windows (8/18) throughout the home w/two QuietCool whole house fans. Large laundry room w/newer cabinets. 3 Car Garage w/large storage area. Summit Amenities include, HOA's youth swim team, Summit Seal, Clubhouse & Pools. Close to Award Winning Schools, Shopping and Easy Freeway Access. No MELLO ROOS"
"Valencia's only gated waterfront community is The Island at Bridgeport and this gorgeous home is one of the best! Cape Cod style, it features light colors & finishes that are current & tasteful. Distressed wood floors, shutters throughout, impressive beamed ceilings, wainscot & upgraded baseboards. Tons of light in this super open floor plan. Full bedroom with attached bath down plus 4 more bedrooms up (2 with private baths & 2 with a Jack & Jill bath). Spacious kitchen with granite counters, white cabinets & stainless steel appliances. Owned solar system so you can stay as cool as you want. The master has views towards the river and also boasts a retreat & double walk-in closets. 3-car split garage. Walk to award winning schools & Bridgeport Park. No Mello Roos in Bridgeport & great amenities - awesome clubhouse, pool/spa, popular walking trials around the lake & more. What a home!" "Vista Point Custom Estate! 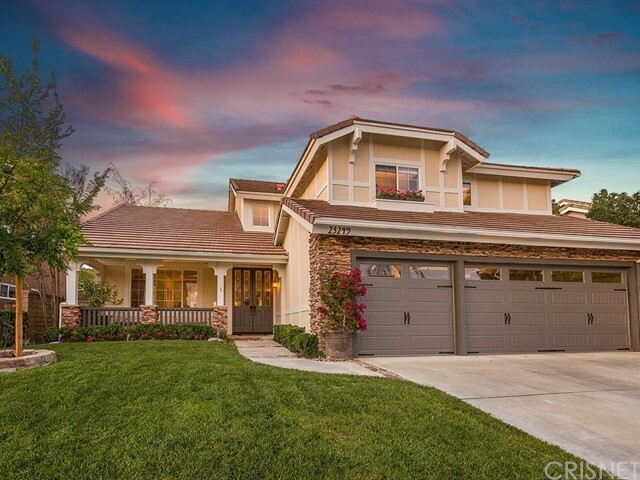 Incredible floor plan offering over 4,000 square feet and located on a cul de sac. Some of the many features include updated kitchen with shaker style cabinets, granite countertops, an island, stainless steel appliances including Wolf range and hood. Spacious master bedroom with an amazing updated master bath which includes quartz countertops, dual sinks, separate steam shower and frameless door to ceiling. Backyard features an inviting pebble tech pool and spa with newer efficient pool motor. Wait - there s more! Entertainer s bar, central vacuum, walk-in closets and newer hot water heater with recirculating pump. 3 car garage and an additional garage door that opens to the back yard. Located all within a short walk to Valencia Hills Homeowners Association resort size pool, tennis courts, playground and clubhouse. Continue walking through some of the most beautiful Santa Clarita Paseos! All this and freeway close! No mello roos and low HOA dues." "Immaculate pool home in the Traditions tract of the prestigious Northbridge community. Located on a cul-de-sac, this exquisitely maintained and updated home features four bedrooms with a master suite upstairs, and a full downstairs bedroom and full bathroom. Upon entry you are met with the exquisite spiral staircase, high vaulted ceilings, and an influx of natural light from every direction. The formal dining room and living room have beautiful views from every window and upgraded carpet. The family room has a cozy fireplace, a custom built-in entertainment center, a ceiling fan and is open to the chef's dream kitchen and both have amazing Travertine floors. The kitchen has a center island with a breakfast nook, granite counters, ample cupboards and stainless steel appliances. The master suite has a fireplace that is also open to the ensuite bathroom, which has a separate shower and tub, dual sinks and tumbled Travertine throughout and a walk-in closet attached. Gorgeous newer Pergo flooring throughout most of the upstairs!! Plus, the laundry room is spacious and has a huge sink and the home is equipped with newer dual zones air conditioning units! The entertainer's backyard features a private sparkling pool and spa that has newer equipment and a sheer descent water fall, a gorgeous patio awning with custom lights, and a generous built-in BBQ. Lots of HOA amenities as well! This home has it all!!"